Today we learn about the baptism of Jesus. While the baptism of repentance that John offered was important, the ministry of Jesus would be far greater. Jesus was God’s Son, and He would give believers the Holy Spirit. Jesus Himself was sinless, but He was baptized by John to show His identification with the sinners He came to save. Throughout his powerful ministry, we see that John the Baptist was always pointing people to Jesus. In the gospel of John, we read that John had great joy in the fact that his ministry would decrease so that Jesus’ would increase (John 3:29-30). In today’s verses, Mark tells us that John did not even think himself worthy of removing Jesus’ sandals, a job that would have been done by slaves. When we really see Jesus as the Holy One of God that He is, all we can do is fall at His feet and worship, thankful that He loves us despite our unworthiness. John’s job was to prepare the way for Jesus by softening the people’s hearts. But Jesus would give those who believe in Him the Holy Spirit. This was fulfilled in the book of Acts when God sent the Holy Spirit on the church at Pentecost (Acts 2). He then continued to give the Holy Spirit to people as they repented and believed in Jesus. For the rest of church history (including today), Jesus would give the wonderful gift of God’s own Holy Spirit to all those who placed saving faith in Him. Why did Jesus submit to be baptized? We know from Matthew’s gospel that John at first refused to baptize Jesus (Matthew 3:14). He recognized that Jesus was God, and thus without sin. So why would Jesus submit to a baptism of repentance? It was symbolic. Jesus was showing that He would take our sins upon Himself. He would die, be buried, and rise from the dead. With His baptism, Jesus went down into the water (buried in death), and then rose out of the water (raised to newness of life). Jesus’ baptism was showing us the gospel! The voice then came from His Father in heaven, showing the people that Jesus was not just a prophet or teacher; He was truly God’s Son. This was the official beginning of the earthly, public ministry of Jesus Christ. Our lives and ministries should point people to Jesus. God has surrounded you with family, friends, neighbors, and teammates. Some people in your world know the Lord, but some do not. When someone compliments us on something good that we do or say, we should say (and really believe) that it is Christ in us who is good, not us. Tell them about the Jesus who has changed your life. Tell them about your Lord and Savior who died for you and rose again. When people see our good works, we don’t want them to glorify us. We want them to glorify our Father in heaven and His Son with whom He is well pleased. Pray for God to let Your light shine for Him today. Here is our second summer devotion as we continue our study in Mark. Today’s passage shows us the ministry of John the Baptist. God sent John as an advance messenger to prepare people’s hearts for the ministry and message of Jesus Christ. God still uses Spirit-filled, powerful preaching today to reach people with the gospel. 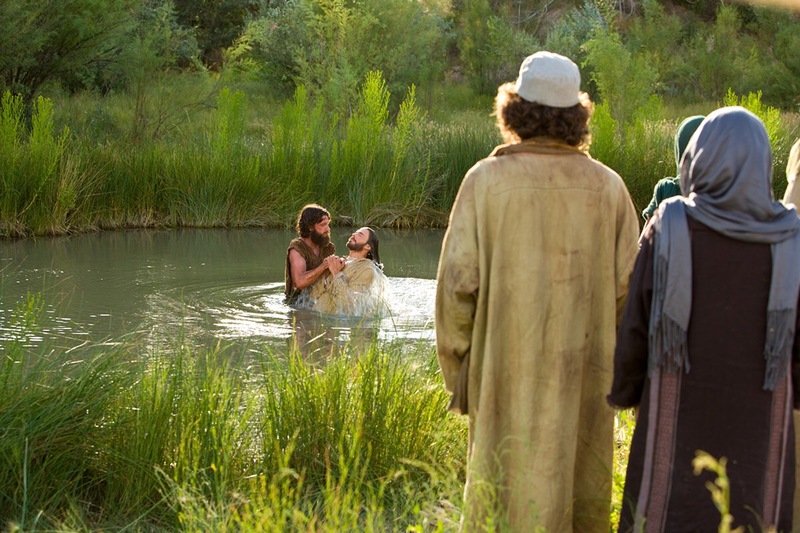 John came baptizing in the wilderness and preaching a baptism of repentance for the remission [forgiveness] of sins. Then all the land of Judea, and those from Jerusalem, went out to him and were all baptized by him in the Jordan River, confessing their sins. It had been 400 years since the people of God had last heard from a prophet of God (Malachi, the last book of the Old Testament). The Lord had been silent, the people eagerly waiting for their Messiah to save them. And then God sent John the Baptist. He must have looked like a wild man. Dressed in camel hair, living in the desert, surviving off a diet of locusts (a grasshopper type insect) and wild honey. Like an ancient Bear Grylls (Google him if you don’t get the reference). But John wasn’t out there in the wilderness trying to prove how tough he was. No, God had sent John to call His people’s hearts back to Him, to get them ready for Jesus. John’s ministry was to call on God’s people to publicly repent of their sins and give their lives to God. Imagine the fire in John’s eyes as he looked at the masses of people streaming out a full day’s walk from Jerusalem to meet him at the Jordan river, near the ancient city of Jericho. Traditionally, baptism had been a ritual for Gentiles (non-Jews) to go through when they wanted to unite with Israel, to become honorary Jews. To ask people who had been born Jews to repent must have seemed crazy. It implied that they needed to be saved, that they were not born right with God but needed to be made right by repenting in their hearts and turning to him in personal faith. This was a bold challenge to Israel. But God’s Holy Spirit was on John, working through John, and the people came to the river by the hundreds and perhaps thousands. They came to publicly repent of their sins and prove it by submitting themselves to baptism. They came to John one at a time, confessing their individual sins and sinfulness and receiving God’s mercy and grace. There was nothing magical about the waters of the Jordan River, just as there is nothing magical about a lake or a heated baptismal pool today. The waters do not cleanse our souls. The baptism that John offered was one of repentance and faith (check out Jesus’ similar message in Mark 1:15). God forgave the people because they honestly and publicly turned from their evil and selfish ways to love and follow Him. The inward change of heart, made possible by the faith that God gives us, that is what saves us from our sins. In the longer description of John’s ministry that Matthew gives us, we see that some of the Pharisees and Sadduccees, the cold-hearted religious leaders who would oppose Jesus throughout His ministry, tried to come to John for baptism, too. He rejected them. John called them a “brood of vipers” and warned them that real repentance would “bear fruits,” or changed lives that came from truly changed hearts (Matthew 3:7-9). We had a lot of public repentance in the Class of 2023 this past spring. Praise God! Our joy meter was going through the roof! Our prayer as a school is that the salvations and rededications were all real. The summer and fall will show the reality of your faith. Keep seeking God each day. Stay daily in His Word and in prayer. Trust and obey the Lord each day and let the work that His Holy Spirit began in your life continue this summer. Walk in the love of Jesus Christ and you will bear the fruits of repentance. God will give you assurance of your salvation as you see His ongoing work in changing your life to be more like Christ.